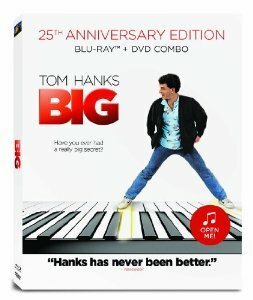 Big 25th Anniversary Edition Blu-Ray Review - Are You Screening? Though Tom Hanks had been around the block several times before Big hit, it’s the movie that really launched him into a top spot in the cultural consciousness. The awesome, but short-lived, Bosom Buddies managed to get Hanks some guest spots on shows like Family Ties, and 1984 kicked off a string off films that, while perhaps loved by some, didn’t exactly serve to rocket anyone to stardom – Splash, Bachelor Party, The Man with One Red Shoe, Volunteers, The Money Pit. 1988’s Big put Hanks on the map in a big way, and audiences were taken by the charm, depth, and overall impressive abilities Hanks displayed in the film. This carried him through a few years of what we have to now hope were contractual obligation films (Joe vs. The Volcano, The ‘Burbs, Turner & Hooch), to the point that Hanks managed A League of Their Own, Philadelphia, Forrest Gump, and Sleepless in Seattle in rapid succession, at which point, Hanks could write his own ticket. Looking back, as we are forced to do with the arrival of the Big 25th Anniversary edition, it’s surprising to note how well the film stands up, especially compared to the rest of this body of work. While some of the films have their fans, none of them hold up well against the 20+ year experience lens (with the exception of A League of Their Own), and not only does Big hold its own, it’s actually still just as strong now as it was then. Despite the fact that the time was plagued with similar stories, none hold a candle to the depth of emotion, humor, and overall fun Big managed, and the film still resonates because it worked a far more serious angle into things. When Josh wishes himself big, and the famous Zoltar machine actually turns him into a grown-up overnight, what we get is not the pseudo-slapstick designs on time’s oldest angst-riddled woes of other films, but a kind of roast of life itself, complete with all the highs and lows of interacting with other people at any age. While the theory obviously must move along the lines of childhood’s simplistic perspective butting heads with the drudgery and world-weariness of adulthood, Big highlights the attempted connections between people that reveals more than just the surface aspects of these interactions. Some of the film’s most iconic moments are those that highlight not necessarily the mere fact that Josh is a kid inside, but that he’s trying to deal with people and situations, as opposed to the adult standards of trying to get something out of them. or work them to his advantage. The film, written by Gary Ross, who is known for a certain situational honesty (Mr. Baseball, Dave, Pleasantville, Seabiscuit), clearly aims at a different direction than most similar films, because rather than thinking it has a clever gag to throw out, it simply offers up the situation in order to see what happens. The main attraction of the release is still the extended cut of the film (because the bonuses are brought over from a 2007 release), which adds just under 20 minutes to the runtime. It’s an interesting version of the film, and any fan will welcome as much additional footage as possible, but it’s easy to see why this wasn’t the theatrical cut. Much of the extra footage involves parents, and puts a bit more gravitas to the whole endeavor, though it is largely contained in the first act. It’s good stuff actually, but the film works the low-points of the struggle well enough already, and there is only so far you can go without detracting from the overall fun of the situation. Without another ten minutes or so that bridges us between extremes, it’s hard to spend too much time suffering with Josh’s parents without losing the ability to bounce back into the carefree piano dance. You also get the Audio Documentary feature which runs as though it were a commentary track, and is as confusing as it ever was. Gary Ross and Anne Spielberg recorded much of the creation process, and those tapes, along with newer audio, is edited together and attached to the film, much like any commentary track would be nowadays. The rub is that it isn’t at all a commentary in the proper sense, and thus the audio has nothing to do with what you’re watching. It is at times incredibly interesting, and at other times a bit rambling, but it will throw viewers off who are used to a certain idea of listening to audio while a film plays in the background. Of course, serious fans will find this a treat, but they already own the 2007 version. Then you get two different workings of the retrospective idea, Chemistry of a Classic and Hollywood Backstory. They run over each other a bit, with one of them being an AMC effort, but they are both a lot of fun actually. Slightly different perspectives showcase much of the production of the film, some of the worries during the film’s creation, and some comment on the film’s place in history. The AMC version includes Hanks himself. They both run right around twenty minutes, and are solid additions, even if they cover the same ground. Beyond that you get a featurette about people who actually work in the toy/game business, a short bit of footage from the premiere party that was decked out like a carnival, and a selection of deleted scenes and trailers. Nothing outstanding, but decent enough add-ons to the film. This is actually a tough one to rate overall, because there are a lot of positives, solid bonus material, and it’s a great film, but there isn’t actually a lot of effort that went into this one, especially considering that if you’re interested in it, you probably already own it. Still, it is a nice package. Two-time Oscar® Winner Tom Hanks* received his first Best Actor Nomination for his disarming turn as a 12-year-old man-child in Penny Marshall’s timeless, “hilarious” (Newsweek) delight. Tired of being a kid, Josh Baskin wishes he was big. When he wakes up the next day, he’s an adult! Now, Josh must hold down a job – and please a new boss (Robert Loggia). Tougher still, he must convince his best friend that he’s still himself, and explain to a beautiful woman (Elizabeth Perkins) who falls for him, that he’s not. Soon, Josh just wants to be a kid again, but can he? As exhilarating as it was during its acclaimed debut, the “warmhearted” (The Washington Post) Big is available as a Blu-ray + DVD combo pack!